ISLAMABAD, Pakistan (CNN) -- Pakistan intensified its military operation to regain control of the country's northwest on Sunday, with fighting focused on the largest city in the Swat Valley. 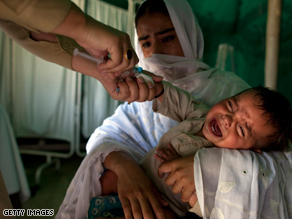 The campaign in Pakistan's northwest has created a growing humanitarian crisis. Troops were engaged in street battles with militants in Mingora, the gateway into the valley. About 15,000 to 20,0000 civilians are in the city, but the fighting has not led to civilian casualties, military spokesman Maj. General Athar Abbas said. Tens of thousands of others have fled. Security forces cleared and secured two important areas in Mingora, he said. One of them is the power station and authorities hope to restore power to the town soon, he added. The ground offensive in Mingora is part of the military's vow to flush out the Taliban from areas in the North West Frontier Province. The militants have long controlled vast swaths of the province, imposing their own fundamentalist interpretation of Islamic law. Muhummad Ayaz, a Mingora shopkeeper who fled the city, told CNN that all its shops and markets are closed. Many homes left vacant by fleeing residents are being used by the Taliban as shelter and as bases from which to fight the Pakistani military, he said. Taliban fighters, armed with heavy weaponry, could be seen on some streets and in some market areas, Ayaz said. There is no food, no power and scant water in the city, he said. Pakistani military gunships were firing into Mingora as of Sunday morning, he said, and the army was controlling all entrances into the city. The military was providing a little food to people at the entrance checkpoints, Ayaz said. He fled Mingora northward toward Khwazakhela, telling CNN he saw abandoned Taliban caves in the mountains along the way. Swat Valley, which is close to the border with Afghanistan, was once one of Pakistan's biggest tourist destinations. However the central government has long exerted little control in the area. As retaliation for the government's military presence, the Taliban carried out a series of deadly attacks, beheadings and destruction of girls' schools. Earlier this year, Islamabad struck a peace deal with the Taliban. As part of the pact the Taliban was allowed to impose sharia, or Islamic law, in the valley. Among other restrictions, the law prevents women from being seen in public without their husbands or fathers. But the deal soon fell apart after the militants took control of the neighboring Buner district. Control of Buner brought the Taliban closer to the capital, Islamabad, than it had been since it mounted its insurgency. The capital of the nuclear-armed nation is just 96 kilometers (60 miles) from Buner. The militants' move into Buner prompted the military's latest offensive. On Friday, the army said it had broken the backs of the Taliban in the valley and was clearing them out city by city. CNN's Ingrid Formanek contributed to this report.